There is NPO with a population of about 5,000 people who are working towards a village where people with disabilities can live a life of their own. NPO” Hidaka Wanowa Kai” parenting mothers gathered in 2003, began a volunteer activity for paid operation to manage tea ceremonies while sharing child-rearing troubles. Currently in the year, it will be 7 to 80 million businesses, and it is becoming an organization indispensable to the region. 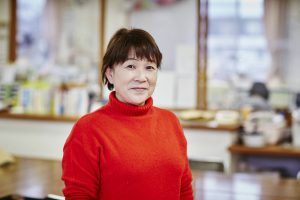 Chiharu Yasuoka, who started this effort, was originally a childcare professional at a child care support center. She came up with the idea about creating a picture-story show and let children hear it at school, when mothers who were raising children gathered and talked. The weak cannot only receive services, but also can be the provider of service, and this name holds a meaning of various people supporting each other and become a loop, like a big family. The project is divided into the following five divisions, each department is devised to operate. This provides support to those who are not covered by nursing-care insurance so that they can live for a long time in a familiar home. For example, supporters of shopping, rehabilitation supporters, farm work and a wide range. Offering lunch and delivering home delivery lunch etc. using vegetables of Hidaka village. This agency offers support with a plan that is appropriate for that person. Employment support type B business office, temporary daytime workplace for persons with disabilities, group home loops manage the house, etc. In order to support parenting in the community, temporary nursing, childcare room, daycare daytime childcare such as disabled children management. Product development and sale utilizing Sugar Tomato at Hidaka village. The encounter with this tomato begins with the farmer helping the tomato harvesting work. Japan Agricultural Cooperative’s nonstandard yet-to-be-eaten tomatoes have been thrown, and farmers seem to have paid about 70,000 yen per year for industrial waste disposal. As it is wasteful, it is offered at the Café club, the taste of tomato sauce has become its reputation, leading to commercialization. It is now a signboard product of “Hidaka Wanowa Kai”. The amount recovered was two tons in 2010 and 7.3 tons in 2017. It also saves disposal costs by reducing food loss, and because “Hidaka Wanowa Kai Party” buys it, it increased the incomes of farmers. ①Person’s circle: Everyone will be connected. ②Talk circle: Let’s circle together and talk. ③Peace circle: The smallest family in society. Value the quality of life there. Hidaka village and the “circle of youth”, “the circle of the city” and “the circle of employment”, connected with the various places, the circle of exchange will expand, dreams are getting bigger. Although it is a small village, if such a support mechanism can be done in the region, it will lead to an overall increase in Japan. Even if a big city wins alone, society as a whole does not get better. It is hoped that it will become an even bigger circle if this kind of connection and mechanism can be done in a local unit on a regional basis. 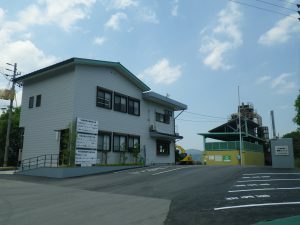 Meiwa Clean Co., Ltd. located in Yamashiro-cho, Miyoshi-city, Tokushima Prefecture, is a waste disposal company with “the only” final disposal site in Tokushima Prefecture and has acquired Eco Action 21 certification by the Ministry of the Environment. Their work is to “bury” the garbage, but it is a unique company which continues to make an effort to “not bury” such as encouraging recycling, and sorting resources by hand before burying. In order to secure a “safe, robust and sustainable lifestyle” for the community, Meiwa Clean Company needs not to only focus on energy consumption but also appropriate managing of waste. Garbage from business establishments and households are sorted by type and processed according to the appropriate disposal method for each type, but eventually they get buried. At the final disposal site, they administer it properly by drilling a waterproof sheet at the bottom of the repository so that there is no danger of contamination of rivers and groundwater. In Japan, the remaining capacity of the final disposal site (how much more can be filled) is tight, but Tokushima Prefecture is particularly in a crisis situation, and the role played by the company is very large. Three years ago, the company opened a Safety Environment Improvement Office and was keenly aware of the 3Rs and SDGs (Sustainable Development Goals). Especially, as a goal of the SDGs 11 “Sustainable cities and communities”, the company devised not to dispose of waste as much as possible. This includes methods such as utilizing discarded tatami mats for the sheet protection of the repository. Also, customers who are dischargers are provided opportunities to learn about “the destination of garbage that has been drawn out” to the nearby elementary schools. 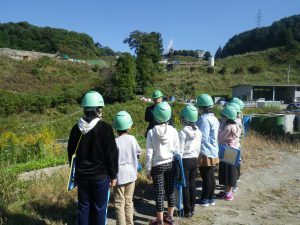 As an example, we received feedback on improvement of environmental consciousness and behavior such as “Living to reduce garbage” and “Bring my bag and my chopsticks” from Miyoshi-city Tateyama Castle Elementary School 6th grade who carried out a facility tour on October 31, 2018. Not only the children but also the people who actually visited the facility were surprised by the amount of garbage and the attitudes towards garbage will surely change as we see the staff struggle with things that are carried away as they are. Through experiences that cannot be obtained from textbooks and books, corporate efforts will continue so that more people will think about garbage problems as their own problem. Japan’s population is aging and decreasing rapidly. It is hard to share the idea of local education in this social environment when the survival of the local community is endangered. In this situation, there are regular meetings of many different people who involve children in various occasions in Ehime. Participants are from a variety of generations and many different backgrounds. The aim of these meetings is to discuss personally without their social status, to share examples and to bring back new problems and findings realized through the discussion to improve the situation of the local community. The meeting also provides the hub of cooperation. To make a nice condition, 15 minutes of dispersed meeting which practitioners from all corners of Japan share examples and discuss about them is held the first day. Which part of the dispersed meeting you join is decided by lottery to facilitate the making of new encounters with other attendees. The 10th meeting was held this year in Ehime. It took two days and one night, and a big event of the night was a charity auction. 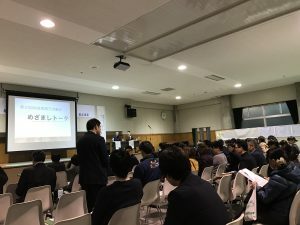 The innovative event was one in which participants brought something like a souvenir to sell at the auction and the profit from it is used to manage the meeting. This helps make this meeting sustainable. The network of local education practitioners are expanding not only in Ehime and Shikoku, but all over Japan.